Gratitude CardI recognize all I receive from others. Give thanks to the people who make your life great. We all have real life fairy godmothers (and fairy godfathers!) we feel thankful for. They might be family members, friends, teachers, members of our community, or even famous people. 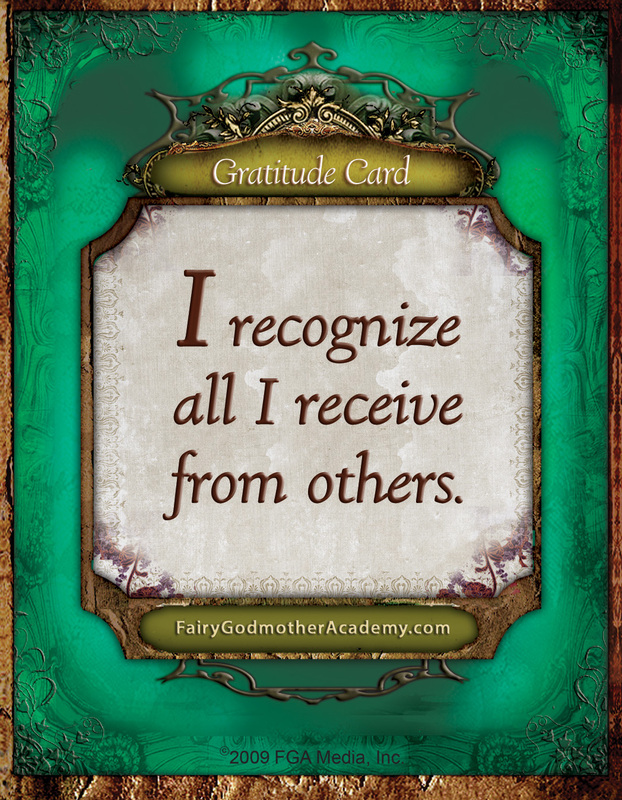 As a fairy godmothers in-the-making, you can practice gratitude by first noticing all the things others do for you, then showing your appreciation with handmade gratitude cards. Make a list of people and the sweet things they do for you. Maybe your dad makes great oatmeal cookies? Or your grandma shares her garden? Maybe you have a friend who gives you courage—just like Kerka does for Birdie. Who knows? You might even be thankful for the city workers who pick up your recycling each week! Stick this list on the wall near your bed or your desk so you can ponder it every day. Choose someone—or more than one someone!—on your list that you’d like to surprise with a handmade card of thanks. 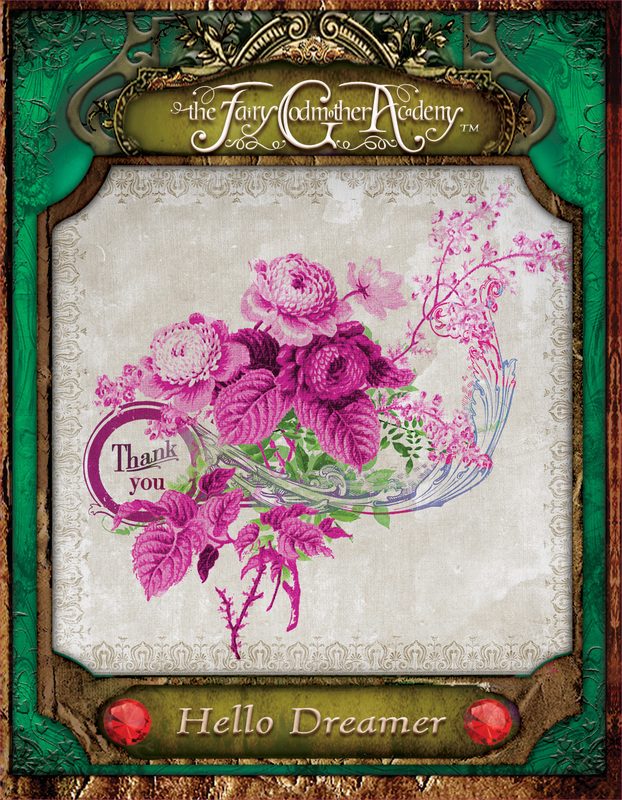 Start with the Fairy Godmother Academy Gratitude Card or with your own paper or cardboard. Decorate with drawings, photos, magazine clippings, stamps, or cool designs. Use markers, glitter, feathers, whatever you can find to make it fun. Now write something heartfelt inside. Describe how much you love the tomatoes from grandma’s garden, or compose a poem for the recycling guy! Express gratitude in a way that feels true for you. Hand deliver your card or find an envelope to address, stamp and send. Or leave your card in a clever spot—stuck on your grandma’s refrigerator, taped to your recycling bin—where the recipient is sure to find it! What special people and actions are on your gratitude list? Who did you make a card for? A family member? Someone far away? How did they like it? Send Birdie an update. She might just post it on her blog! Dankbarkeit ist wichtig…aber wie kann man einem Menschen sagen das man für das was er für ihn tut das beste ist was ein Mensch je für ihn gemacht hat?Weil meine Eltern sagen das ich nicht dankbar genug bin… ich weiß nur nicht wie ich das ihnen sagen soll,ich habe alles,ich bekomme alles aber ich weiß halt nicht wie ich ihnen richtig danken soll. Sometimes it is hard to express our thanks properly, especially to our parents. Gratitude cards are a great first step. Just trust the words from your heart! thanks for your comment sternilie99.. Gratitude is important … but how can a man say it for what he does for him is the best thing a person has ever done for him? Because to tell my parents that I am not grateful enough … I just do not know how I tell them to, I have everything I get everything but I do not know how to stop properly thank them. My grandma is an artist and I love art too so I always show her my artwork. I made her a card for supporting me in my art. I haven’t given it to her yet though because she is on Vacation but when she comes back I will give it to her. I made my parents each a card. They have not seen them yet! I can’t wait until they get all happy that I gave them each a card! made one for my mom! Ummmm… Birdie? Yeah. Help me. What am I supposed to write? I just made a card for the recycling man! Me and Dad are on vacation, so I can’t wait to see what he writes back when I get back! Ich fühle mich genauso wie Sie. Mein Rat ist , nur um mit ihnen darüber zu reden . Lassen Sie sie wissen , wie du dich fühlst. I did this as a child, but reading this now gives me a great idea, for people I can do it for now! Thank you! What is your fave wisdom act? My fave is totaly the Spirkin or Local lineage! I just made a map of my BFF’s sisters friends friends cousins new house!!!!! I’m sorry Kerka does have bad spelling! We are your fans and you are ours. I had to write the comment birdie is Kinda busy but those are her words. As a child I made one for my Mom and for my Grandmother – it was sort of like a colourful little book – and both of them kept theirs for the rest of their lives. I didn’t think my little book-cards were very good when I made them; I remember feeling ashamed and thinking, “Another child would do this much better!” But it meant so much to my Mom and Grandmother.